Did you know NEWA can load past weather data into your favorite online tool at newa.cornell.edu? It’s the dead of winter which is a perfect time to look back at the 2017 growing season. Read this article to learn more about historical data access using NEWA. The NEWA website is popular because real-time weather data provide short-term risk assessments during the growing season. But, have you ever looked back and asked yourself what went right or wrong? 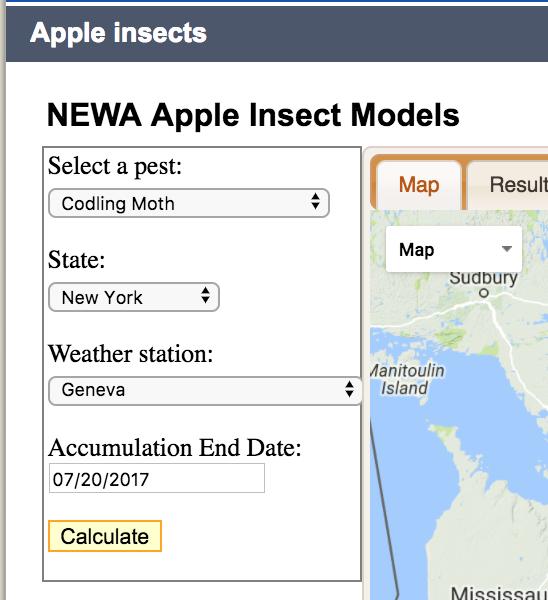 NEWA tools can also be used to follow insect or disease risk historically through a period of time. You can access this feature using any model or tool available on the NEWA website. 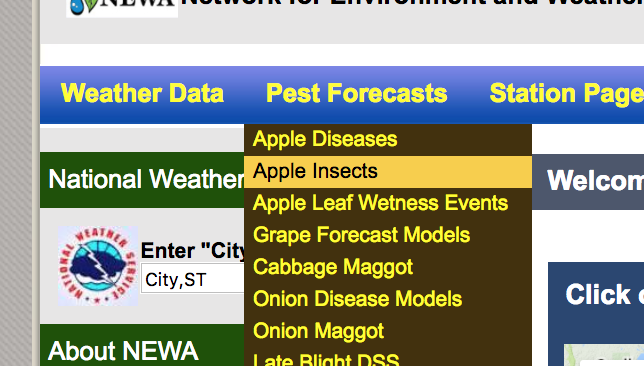 From the ‘Weather Data,’ ‘Pest Forecasts,’ or ‘Crop Management’ dropdown lists in the website navigation bar, select your model of interest. Select your pest or disease, State, and Weather station and historical Accumulation end date. Every once in a while, we get a question about historical data from an ‘inactive’ station, which is a NEWA location that no longer transmits to the website. Historical weather data can still be accessed using the hourly or daily weather summary tools. From the ‘Weather Data’ dropdown list in the website navigation bar, select Hourly Data or Daily Summary. 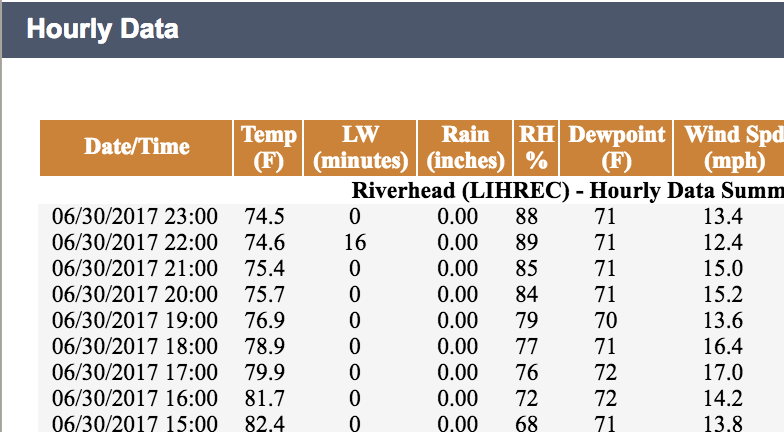 Scroll to the bottom of available weather stations and find a station of interest. Choose a month and year from the past. This table summarizes the availability of NEWA models and tools with ‘active’ and ‘inactive’ stations on NEWA. Follow the links to view tools and resources at the NEWA website. 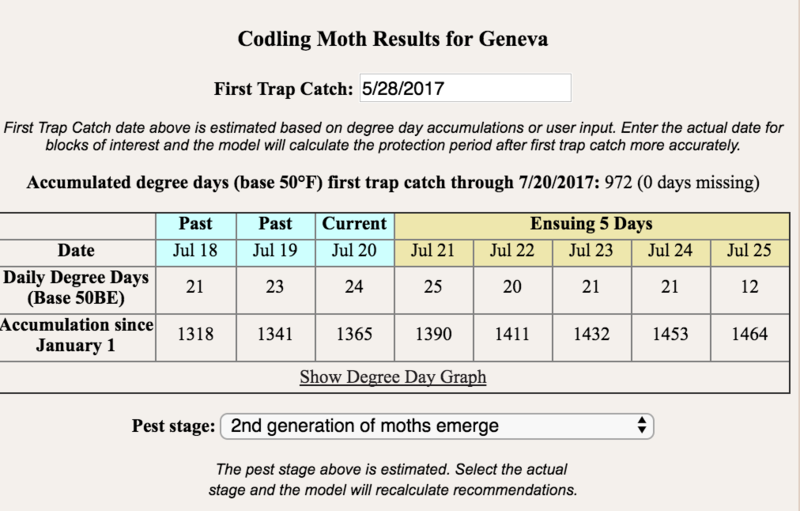 This entry was posted in about models, information, IPM, learning, weather stations and tagged Cornell University, inactive, NEWA, NYSIPM, weather stations on January 3, 2018 by Dan Olmstead.